Shanghai City, China, Nov. 11, 2014 – Hartzell Propeller Inc. has received validated type certifications from the Civil Aviation Administration of China (CAAC) for Hartzell props flying on Beech King Air B200, Piaggio EVO and Daher-Socata TBM aircraft. The company is exhibiting at Airshow China 2014, held Nov. 11-16 in Zhuhai. Hartzell’s China- and U.S.-based personnel will be located in the U.S. Pavilion at 1B-T6B. Airshow China, which is endorsed by the Chinese central government, features aircraft, trade talks, technological exchanges and flying displays. “Airshow China 2014 is an excellent venue to explain advantages of the latest developments in propeller aerodynamics and manufacturing techniques to the global aviation community,” said Weiqing Wang, Hartzell Propeller Managing Director for China, based in Shanghai City. “Hartzell Propeller’s ongoing efforts in China are focused on working with aircraft manufacturers and the CAAC for advance approvals for propeller aircraft that are certified for operation in this country. We want to express our appreciation for the professionalism exhibited by CAAC representatives during this process,” he added. 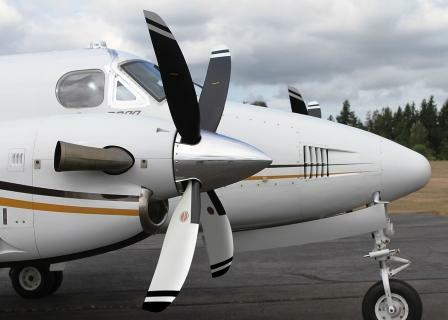 CAAC type certificate validation for the King Air B200 aircraft is for Hartzell Propeller’s four-blade aluminum hub props with swept aluminum blades for retrofit by Raisbeck Engineering Inc. The Hartzell design and manufacturing expertise permits an increase in thrust while providing noticeably lower cabin noise. The five-blade propeller validation by CAAC covers highly swept wide-chord aluminum alloy propellers for the new Piaggio EVO. Hartzell worked with Piaggio to develop propellers that in conjunction with changes to the nacelle and engine exhaust geometry combine to reduce external noise by 68 percent. Passenger comfort is also improved by a cabin noise reduction of 20 percent, attributable in large measure to Hartzell’s five-blade scimitar design. CAAC also validated Hartzell composite, five-blade, swept-tip props for DAHER-SOCATA’s new TBM 900 and as a retrofit for TBM 700 and 850 aircraft. In the single-engine TBM 700/850 Hartzell’s aerospace-grade five-blade swept-prop generated as much as 10 percent faster takeoff acceleration, two knots higher cruise speeds, and 100-foot per minute better climb rate. Hartzell’s new TBM propellers also created measurably less noise in the cabin and at the airport compared to previous propellers. When compared to wood-grade propellers, the climb performance is even more pronounced and the cruise speed advantage goes up by as much as five knots. To support the increasing globalization of general aviation, Hartzell Propeller has established a dedicated Type Certificate Validation Department. The Validation Department is committed to developing enhanced professional relationships with the CAAC and other airworthiness authorities worldwide.